My son repairs and (occasionally) sells guitars and other stringed instruments. 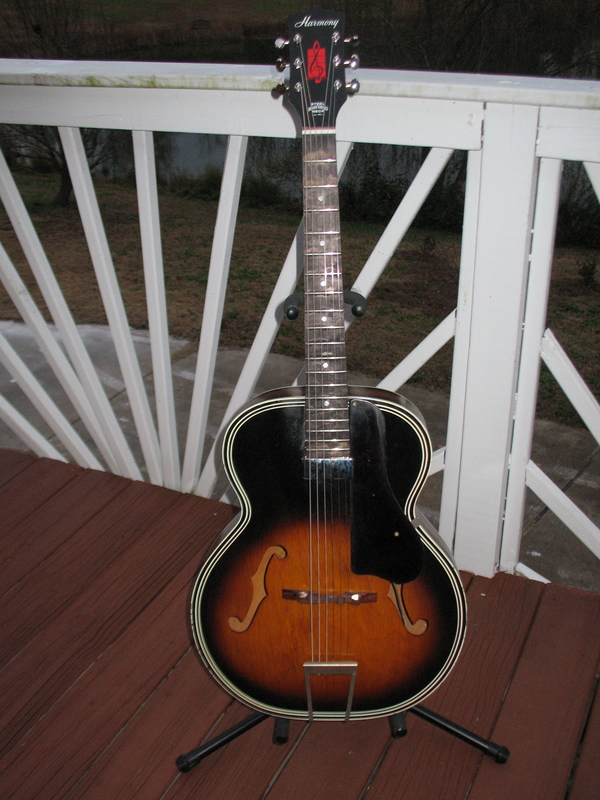 A while back, I purchased a “vintage” Harmony archtop guitar from Ebay. I only look at the “vintage—pre 1980s” section on Ebay, because most modern guitars are made of laminated something. He prefers the ones made of solid woods, and the older, the better. When my son rebuilt the guitar, he replaced the cracked pick guard with a new one that he had made, and he added new tuners, a new bridge, and a pick up system, so the guitar could be plugged into an amp. No doubt someone will enjoy it, but that is not the point of my little story. After he finished it, I took it out to the deck to take a couple of photos, which I put on the local Craigslist, and I labeled it a “Vintage Archtop with a Pickup.” So, a day later, he gets an email from “Joe Joe” who says the guitar is no doubt a nice player, but it is an old, rebuilt guitar, but not a vintage guitar. And, a la Archie Bunker, he said “look it up.” As an English major, I was just a bit peeved. The term “vintage” stems from winemaking. (Don’t cha love that pun?) A wine is said to be of a certain vintage, based on age and quality. That word is typically a noun. The term vintage, used as an adjective, can also mean old, and if you don’t believe me, look at Merriam Webster online. To give him credit, Joe Joe (isn’t that a cookie at Trader Joe’s?) was right; there are collectors of vintage instruments who strive to get items from some rather undefined “golden era” and these items should have no modifications. Such instruments do exist, for a price. I think the term collectable would serve better than vintage, but, really, isn’t this just semantics? Anyway, my son has this nifty guitar for sale, whether it be vintage, old, nice, rebuilt, or some other term. Young adult fiction is the best place to look for new ideas, or old ones wearing new garb. Marissa Meyer’s Cinder is the latter, as it is a science fiction version of Cinderella. The reviews were fabulous, so I purchased the eBook version, and promptly pushed it aside. Part of me wants to dislike YA, since I skipped into the adult section at the local library while I was in the seventh grade. Instead of beginning Cinder, I read a nifty self-help book called the $10 Root Cellar: And Other Low-Cost Methods of Growing, Storing, and Using Root Vegetables (Modern Simplicity). Yeah, I know, I can’t quite believe I read that one either. But, hubby and son have been watching a bunch of YouTube vids on how to survive a time WOROL (without rule of law) and/or zombie attacks. And, I don’t know about everyone else, but if I am staying cooped up, I want something to eat! Okay, okay, I digress. So, having learned all about burying an old fridge to store root veggies in (for that zombie apocalypse), I pulled up Cinder on my iPad. And, almost immediately, I was hooked. The character is amazing; Meyer has so skillfully drawn her, that I can just see her stuffing her grimy gloves in a back pocket. And, yes, there should be little suspense. How many times did my kids watch the Disney version of Cinderella? Not to mention my reading the Golden Books version to my daughter. She used to call the stepsisters, “the uglies.” How cute, right? So, I know the plot. But, while Meyer’s tale is sorta/kinda true to the traditional tale, there is sufficient deviation to give the reader some suspense. And, the narrative is pretty good, but the characters just about jump off the pages. Especially Cinder, who is a cyborg with a mean stepmom, two flighty “uglies” A/K/A stepsisters, and an android or two for good measure. The queen of Luna is perhaps the best villainess I have read about this year. Maybe this decade. Others have noted that the Oriental overtones seem to be grafted onto the story, and that is a valid criticism. But, I am not sure that the storyline would have worked at all if the characters had been more realistically Oriental. This yarn is the first in a series, and I am looking forward to revisiting Marissa Meyer’s retelling of traditional stories. So, even if you don’t get into re-tellings of fairy tales, if you like gritty science fiction, you might just like this story. And, if you do like re-tellings, this one is very good. I’m mostly steering clear of controversial topics on this blog, as it is very much devoted to reading and writing. The main reason I abandoned Pam’s Pages was that some of the posts were deemed controversial by family and so-called friends. But, as a science-fiction fan, I remember wanting to see V for Vendetta, but not wanting my (then) impressionable children to see it. The film promised violence as well as controversy, as well as Star Wars veteran Natalie Portman in a main role. There were reasons the kids would want to see it, and there were reasons I did not want them there. So, I dropped the kidlets off at school, did a couple of errands, and went to a large mall on the outskirts of Atlanta to see an 11:00 am showing of the film. T’was a surreal experience, and I am not talking about the movie. There were only a couple of other patrons in a very large cinema. And, that was one of the few times I had popcorn for lunch. Of course, V for Vendetta is a powerful film, but the intimate showing made it even more so. That gi-normous screen held my attention, and there was not so much as a cough or a crunch from a fellow patron to distract me. While I understand that the author, and then the producer, view the graphic novel/film as a reaction to overly conservative government, I see it as a cautionary tale against any sort of totalitarian regime, regardless of whether it swings to the right or the left. As a child, attending public schools in the 1960s, (yes, I am that freakin’ old) our teachers sometimes warned us about propaganda. Those educators saw it as the weapon of choice in the Soviet Union’s means of keeping communism going, and they wanted their pupils to understand the power of media under governmental control. So, from an early age, I was taught to look beyond face value at message, any message, and to search for truth. In V for Vendetta, the message may be a bit heavy handed, but any government can get out of hand, if the people do not maintain control. And, as a youngster, I had few doubts about Walter Cronkite’s version of the “news,” but quite a lot of modern day media tends to make me cringe, and that is on both sides of the American political spectrum. What to do, then? Well, I am not advocating blowing up anything. Nor do I advocate becoming un-engaged in political discussions. However, it is necessary for people to renew their efforts to evaluate governmental policy, from the local school board to Capitol Hill, not in terms of “what do I get?” but in terms of “is this the best way to rebuild a nation that is in deep trouble?” We must do so without “fact checking” journalists and/or highly paid lobbyists. Only then will the leadership void be filled. Otherwise, historians will look back at our time as the beginning of the end of the United States. Oh, and this would be a great day to watch V for Vendetta. Actually, any day is a good day to see it. Bring on the popcorn.